Three Iraqi soldiers threw themselves on a suicide attacker wearing an explosives vest at an Army Day celebration Sunday - an act of heroism the U.S. said likely prevented many more deaths. Iraqi police said at least 11 people were killed in the blast, the deadliest in a series of bombings in Baghdad. One of the attacks in the capital killed an American soldier - one of two U.S. deaths announced on Sunday. Shortly before the bomber struck the Army Day festivities, about two dozen Iraqi soldiers were standing outside the offices of a local non-governmental agency pushing for unity in Iraq. The troops, their AK-47 rifles raised in the air, chanted pro-army slogans and a common anti-insurgent taunt: "Where are the terrorists today?" Associated Press photographer Hadi Mizban was about five yards away from the suicide attacker when he blew himself up on a narrow street in the central Karradah area. "The blast happened as civilians were giving flowers to soldiers and sticking them in the muzzles of their guns," recalled Mizban, an Iraqi national. "It was a jubilant scene." Afterward, he said, the street was littered with bodies, weapons and shoes. Dazed soldiers and policemen carried their bloodied colleagues to nearby pickup trucks that whisked them to a hospital. 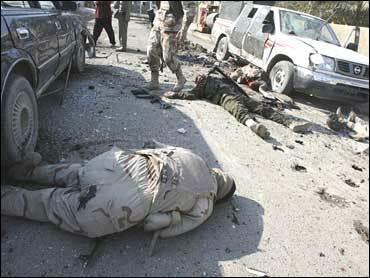 "There was a severed head on the street and some of the soldiers that I was photographing earlier were dead. Those who survived panicked, pulling back from the scene and shooting in the air," said the 40-year-old Mizban. Among the dead were four police officers, three Iraqi soldiers and four civilians, a police officer said on condition of anonymity because he was not authorized to speak to reporters. At least 17 people were injured. A U.S. military statement said five people were killed. The discrepancy could not immediately be explained. "These martyrs gave their lives so that others might live," said Lt. Col. Steve Stover, a U.S. military spokesman. In the north in the Iraqi city of Mosul, meanwhile, three apparently coordinated explosions targeted two Christian churches and a convent, local officials and the U.S. military said. There were no deaths, but four people were wounded. "They are cowards," a priest told The Associated Press, refusing to give his name because he feared for his safety. "We don't know what message they want to convey." "This act will only foster our insistence to remain loving brethren to all sects in the city. I'm sure that those who committed this crime are far away from religion." The attacks in Mosul, 225 miles northwest of Baghdad, began mid-afternoon when a parked car bomb exploded near a Chaldean Catholic Church, causing damage but wounding no one. About 30 minutes later, another parked car bomb exploded in the eastern part of the city near an Assyrian Christian Church, damaging the building and wounding four passers-by. Nearly simultaneously, a bomb planted near a Chaldean convent in western Mosul exploded, damaging the structure and a few nearby houses. No one was hurt. Violence in Iraq has fallen by some 60 percent in the last six months, according to the U.S. military. Al Qaeda fighters were driven northward from Baghdad and Anbar and Diyala provinces by angry Iraqi Sunni Muslims who joined American forces, who were bolstered by 30,000 additional troops last summer. In other violence, a parked car bomb exploded and four mortars landed near a bus terminal in eastern Baghdad, killing a civilian, police said. In northeastern Baghdad, a parked car bomb exploded outside a popular restaurant, killing a policeman and two civilians, police said. Earlier Sunday, a Shiite tribal sheik who was trying to set up a U.S.-backed group to combat militias was shot to death in Shaab, one of Baghdad's most dangerous neighborhoods and a center for outlaw Shiite fighters, a police officer said on condition of anonymity because he was not authorized to speak to the media. The attack was confirmed by a resident of the neighborhood who asked not to be named, saying he feared reprisal. Near Muqdadiyah, about 60 miles north of Baghdad, a joint Iraqi-U.S. patrol on Sunday discovered five severed heads, Iraqi military officials. No further details were immediately available. The U.S. military said it had no information about the macabre discovery. Near the city of Khalis in Diyala Province northeast of Baghdad, suspected al Qaeda in Iraq fighters attacked the house of a local sheik and kidnapped him and 13 members of his family, an official from a joint coordinating office said. The day before in the restive province, an American soldier was killed by a roadside bomb, the U.S. military said. Another U.S. soldier was killed Sunday in a roadside bombing in southern Baghdad.